Diabetes is one of the most common chronic conditions in the U.S. today, with almost 30.3 million of people suffering from difficulties in managing their blood sugar. It is the seventh leading cause of death, and the No. 1 leading cause of kidney failure, adult-onset blindness, and lower limb amputation. Most people with diabetes have Type 2 diabetes, which is often associated with lifestyle choices and genetics. It is the type of diabetes that is caused because the body has trouble using insulin properly or can’t make enough. About 1.25 million suffer from Type 1 diabetes, which is an autoimmune disorder. It’s the type of diabetes that is a result of the pancreases not making any insulin. A diabetes patient waits in the waiting room at a clinic in south Los Angeles, Aug. 7, 2012. Both conditions result in difficulty regulating a body’s glucose — or sugar — levels, but due to very different reasons. Since November is Diabetes Awareness Month, it is a good time to answer frequently asked questions about the disease. So let’s start with what happens in a normal person without diabetes. When you eat a meal, your body begins to digest it into protein, sugar and fat. An organ called the pancreas senses the absorbed sugar and produces a hormone called insulin, which then pulls the sugar — or glucose — from the food you just ate and into different parts of your body so that it can be used for energy. In diabetes, your body either doesn’t make enough insulin or can’t use it as well as it should. If you don’t have enough insulin, too much glucose stays in the bloodstream, which can cause serious health problems over time, such as heart disease, kidney disease or vision loss. In patients with Type 1 diabetes (T1DM), their pancreas is unable to produce insulin at all, due to an autoimmune condition whereby the body attacks itself. People are more frequently diagnosed when they are children or young adults, and symptoms often develop quickly. They may report feeling very thirsty, going to the bathroom very often, losing weight even though they eat normally, and feeling very exhausting. A CDC graphic talks about Type 1 Diabetes. People with T1DM need to take insulin every day to survive, and currently, there is no known way to prevent or cure T1DM. They need to check their blood glucose levels several times a day and at night, and give themselves insulin multiple times a day based on their body makeup, blood sugar and what they eat. T1DM was previously thought to be only in children and was previously referred to as “juvenile diabetes,” but we now know that young adults and even older adults can develop T1DM. It is not something contagious, or related to your lifestyle. Rather, it is an autoimmune condition, whereby your body develops antibodies against your own pancreas and gradually destroys the pancreas’ ability to produce insulin. In patients with Type 2 diabetes (T2DM), either the body has become resistant and needs more insulin or their pancreas is not making enough insulin. Their body has a hard time keeping the blood glucose at normal levels. T2DM is not caused by eating sugar itself, but by a variety of lifestyle factors and genetics. This is the more common adult form of diabetes, and unfortunately, the numbers of affected people, including children, in the U.S., continues to rise. This type of diabetes is associated with obesity, high blood pressure, high cholesterol, or a family history of T2DM. A CDC graphic talks about Type 2 Diabetes. If you have any of those conditions, it is important to see your primary care doctor regularly to be tested for diabetes. Most commonly, it is diagnosed with a blood test – either a high glucose level before you eat or something called a hemoglobin A1c, which is an average of your blood sugar over three months. If your glucose level is high, you may feel symptoms like feeling thirsty all the time, urinating more than usual, weight loss, blurry vision or fatigue. Sometimes, people with Type 1 diabetes present very sick, with something called diabetic ketoacidosis, due to not having enough insulin in their body. If you are on medications that can make your blood sugar go low, such as insulin, low blood sugar can result in sweating, shaking, uncharacteristic behavior, or disorientation. If it goes very low, it can even result in coma and death if not rapidly treated with glucose or a medication called glucagon. 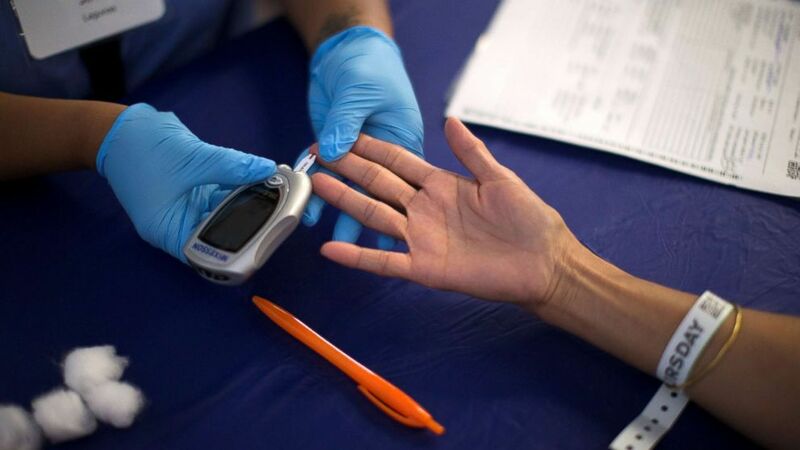 A person receives a test for diabetes during Care Harbor LA free medical clinic in Los Angeles, Sept. 11, 2014. If you notice any of these symptoms, you should notify your doctor. How do I treat diabetes? Is there a cure? Unfortunately, diabetes is a chronic illness with no cure. For people with Type 1 diabetes, the only treatment so far is insulin. For people with Type 2 diabetes, in addition to dietary changes, there are many medication options that vary from pills to injections. Some types of bariatric surgery may be helpful in decreasing the amount of medications people with T2DM need to take. There are many novel technologies being developed to help improve the daily lives of people with diabetes. Although Type 1 and Type 2 diabetes are invisible to people who don’t have it, having a blood sugar that is too high or too low can be very dangerous. But with good control and continual improvement in medication and technology, many people with diabetes are able to lead happy, fulfilling lives. Tiffany Yeh, M.D., is an endocrinology fellow at New York-Presbyterian Weill Cornell Medical Center and a member of the ABC News Medical Unit.